God of War: Ascension may have been entertaining, but it showed that Kratos had lost the Midas touch. 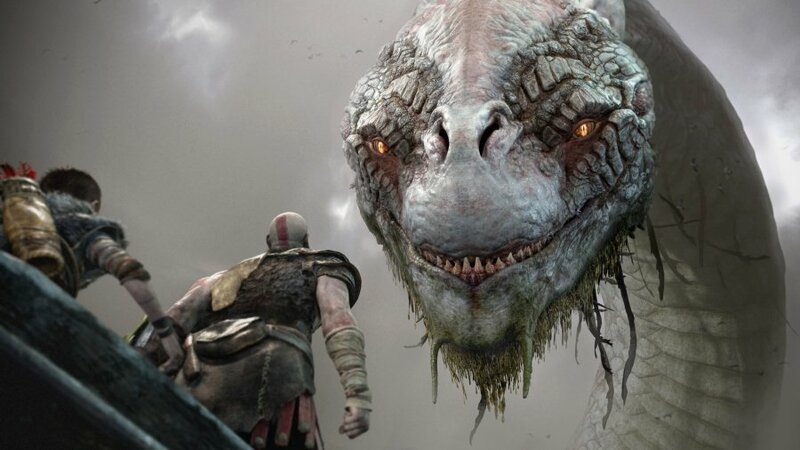 Sony Santa Monica’s reluctance to experiment with a formula that had already been recycled five times prior left one of PlayStation’s best-known protagonists in a precarious position: was there even a way back for the Ghost of Sparta? On the evidence of this sublime PlayStation 4 soft-reboot, all that was required was a change of perspective, mythology, and design philosophy. Easy, right? Read on for our God of War review. This is a special game, and it’s evident from the opening exchanges. 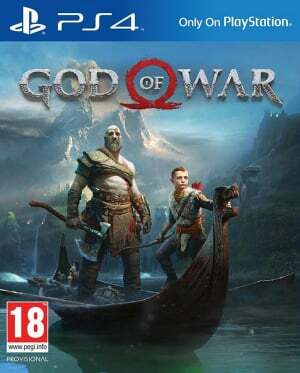 A sequel set many years after the Greek trilogy, Kratos is now a father taking refuge in the Norse realm of Midgard with his son Atreus. At the very beginning of the 25 hour plus storyline, the pair are preparing to cremate the Ghost of Sparta’s late wife. The title lets the outrageously articulated character models reveal their emotions, as the title leans on subtlety for the first time since its inception over a decade ago. 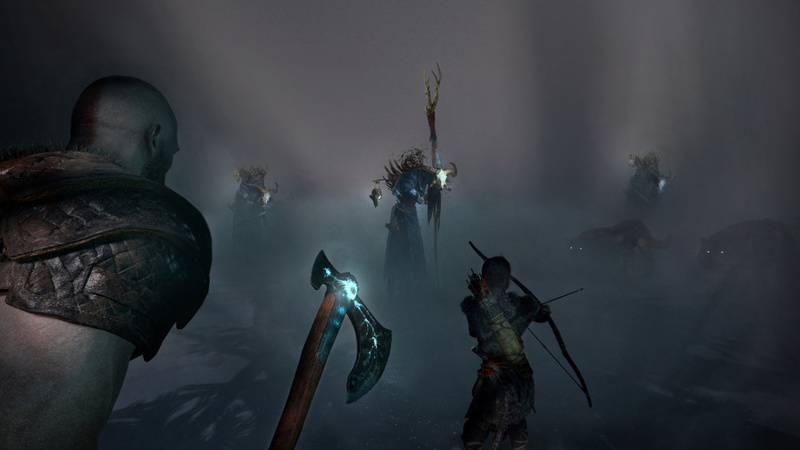 This is a different kind of God of War – and it’s all the better for it. There’s actual nuance to Kratos’ character now; he still exhibits the blind rage of his predecessor, but this is a coming of age story for both him and his spawn. After the events that transpired with Zeus, the protagonist is learning to become a father. Similarly, his son is discovering what it means to be a God, all while the pair journey through several of the Norse mythology’s nine realms. Structured similarly to a modern Tomb Raider title, the game allows for exploration while simultaneously funnelling you through its pristinely presented fantasy world. There are a handful of side-quests to pick up, gameplay-based challenges to complete, and no shortage of collectibles to snag. All things said, with the dozen or so optional bosses factored in, there’s well over 50 hours of high quality gameplay here – it virtually eclipses the running-time of all previous six games combined. But this is one of those releases that encourages you to play your own way. There are mini-puzzles to complete in practically every environment, but if the dopamine drip-feed of solving these doesn’t do it for you, then you’re free to push on – minus the loot, obviously. 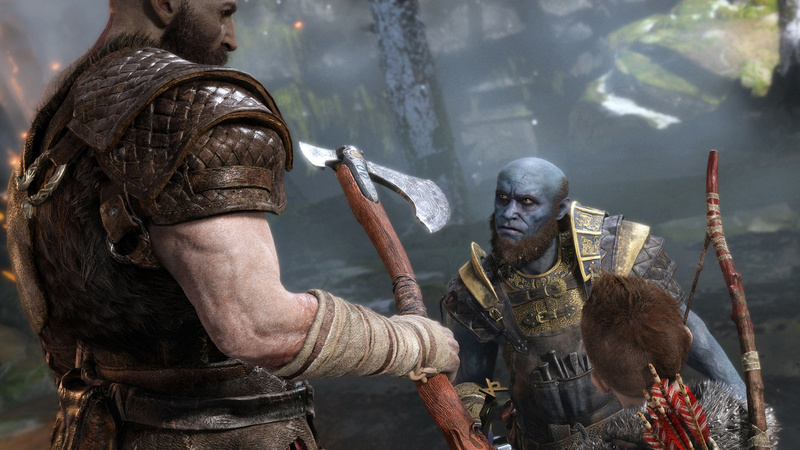 Speaking of which, for the first time in the franchise Kratos is deeply customisable, with his armour and axe including numerous slots for you to alter the character’s attributes – and even his abilities. While old-school character action fans may balk at the absence of a Street Fighter-esque move list, there’s a grace to the title’s combat system that rekindles the frantic feel of previous releases – despite the change in perspective. With the camera pulled behind the protagonist, a new quick-turn button is essential – while Atreus will bring your attention to incoming threats in a similar manner to the “voices” in Hellblade: Senua’s Sacrifice. It’s fast, fluid, and appropriately ferocious. But there are wrinkles to the action that are all-new. Kratos can throw his axe, stalling enemies before recalling it. This addition, so small on the surface, is weaved into practically every facet of the campaign, as it’s used for puzzles, navigation, and much more. Similarly, Atreus is assigned his own button prompt, and can be called upon during combat to stun or attract the attention of antagonists. There are some foes that can’t even be beaten without the youngster’s input. This mechanic helps build the bond between father and son, and there’s a real arc to the way that the relationship between the pair unfolds. While moods do change a little hurriedly in places, the character development is more on par with what we’ve come to expect from a Naughty Dog title – which is a compliment, of course. Impressively, the game balances dark subject matter and some fairly heavy tones with a real laugh out loud sense of humour, owing to a superb supporting cast. And of course, it looks and sounds phenomenal from start-to-finish. Guerrilla Games may have raised the visual bar with last year’s Horizon: Zero Dawn, but God of War releases its Spartan Rage and lifts it ever higher. This is an absurdly beautiful game, which blends hyper-realism with outright fantasy to memorable effect. The character models are staggering, but they’re arguably exceeded by the remarkable environment art. And yes, there are some truly stunning set-pieces which punctuate the plot. Perhaps the most impressive thing is that the game starts like a rocket, and rarely takes time to breathe. There are a handful of very minor lulls, and the odd climbing sequence may grate in subsequent playthroughs, but for the most part it’s meticulously paced. The title does a brilliant job of constantly introducing new mechanics, meaning there’s always something new to play with before you’re ushered along to the next big thing. And this will extract the completionist in you, as areas are revisited in Metroidvania fashion, opening up new pathways and secrets that couldn’t be accessed before. It’s a wonderfully designed game that never feels like it’s short on ideas, and its core story has more than enough surprises to keep you engaged throughout its substantial running-time. With multiple difficulty tiers and a hearty helping of side-content too, this is as fulfilling as single player releases come. God of War is a special game. 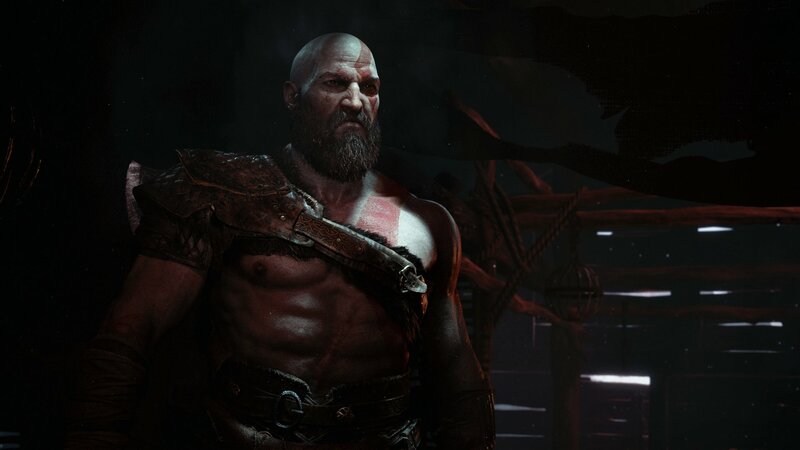 This reimagining of the famous PlayStation franchise elevates the series in unexpected ways, without forgetting the core tenets that made Kratos a fan-favourite to begin with. This is a sprawling single player epic with an abundance of secrets and a storyline that keeps you hooked from start-to-finish. While it borrows liberally from other action adventure greats, its unique combat and outstanding artistic direction separate it from its immediate peers. A truly impressive achievement. As always, I'm happy to answer any and all questions that I can. Sony's embargo is very strict for this game, so please keep in mind that I may not be able to answer everything. They're very keen on keeping spoilers under wraps (which is a good thing). That said, drop me a reply and I'll get back to you. Yes! Haven’t read the review yet but very happy with that score. This game looks stunning, I cannot wait. What game would you say you can compare this too apart from another god of war game. I was already hyped to play this but this review has the anticipation kicked up to 11 now. Sounds like it's doing exactly what the original God of War did back in 2005. A re-invention that's done right. The combat, which was my main concern, is different but intriguing. All the gameplay I've seen the last month or so has me believing I'll enjoy it. @get2sammyb is there day one patch while you played it for review ? Wow this game is crushing its reviews pretty much everywhere. I expected it to be good but great to see many 5/5,10/10 etc. Only 8 more days!!! Didn't read all of it, because I'm trying to avoid spoilers as much as I can, but last few paragraphs were satisfying to read! it's currently rated 94 on metacritic from 52 critics reviews.. next friday can't come soon enough. does it have an thorough & logical explantation for the ending of god of war 3? Right that is enough for me, I'm gonna pre-order this bad boy! Sorry for asking this again. Does the game save the cinematic scenes,as you progress through the game? Is your review 100% spoiler free? Can I read it, Sammy? Wow, well done Sony (and Santa Monica studios), looks like you've delivered another high quality game to add to the PS4s already impressive portfolio, looks like 2018 is definitely turning into another golden year. Looking forward to playing this one immensely! I must say I'm still sceptical, sounds too much like a Tomb Raider/Uncharted checkpoint fest with an annoying little kid mechanic added so Kratos can climb up ledges. Hope to be proven wrong though. dope review brother! where @playstation1995 at? word up son! This makes me so happy for fans, Sony Santa Monica, and all PS4 owners. The wait is going to be excruciating for my digital preorder to unlock. Thank you for the review! Thanks for keeping it spoiler free! Don't be Sorry, be Sony Santa Monica. My god I'm so hyped! I love that Sony are so confident with their games that they let reviews out early, but now I have to wait a week! I better get my preorder in with GAME or Argos. It's worrying that AmazonUK are STILL SOLD OUT! @get2sammyb Great review, Sammy. It must be good to get a 10 from you! Do you need to have to played the previous games to fully understand the story? Great review @get2sammyb, however, my wallet does not thank you! @munkondi dude with the dozens and dozens of reviews out now that shut that ridiculous concern down how can you still say that? @get2sammyb I think the video review is probably the best you ever did. Sony can send you a thank you note, because you totally sold me on this game. @PS4fan It reads like an April Fool's joke. @PS4fan There was always going to be a few like this. There always is, just like there was with Breath of the Wild. Someone will always find something to dislike, and this writer is clearly one of those that puts more emphasis on their writing making a statement about them, rather than its actual subject matter. Which is fine in some cases but when you're reviewing one of the biggest releases of the year, it comes across a bit juvenile. But hey ho. Anywho, GoW is sounding pretty amazing, all things considered. I'll admit I've never been the biggest fan of the franchise - they were always spectacular and fun but for some reason didn't quite click with me in the way they seemed to with everyone else. This new one sounds like a heck of an experience though and I can't wait to try it. Think I might have to get a PS4 Pro for this one too - @get2sammyb - do you know if there's much difference between the two versions? @SegaBlueSky what are you on about? This review is perfectly written - to not spoil even one bit while being clear that we are dealing with a truly special single player action/story driven game. EDIT: Oooh, apologies. My bad. You were commenting on the pc"authority" review. I sincerely apologise for misreading your comment. Pathetic, not even an 11. I've only been interested in this game for about a month, but it feels much longer...I won't be able to play it right away though as I want to finish the Uncharted games first. Currently on Uncharted 3 now. And then I'm gonna play the other God of War games to get me ready for this one! Its what I expected and partly hoped they would deliver. GoW was always far too vacuous for my liking - just bashing buttons to get the highest combo but this seemed so much more mature, more story orientated, more evolved - which is why I ended up pre-ordering. Glad it seems to have delivered!! @Octane you can read it in full. @get2sammyb did a masterful job right there. No spoilers whatsoever. Amazing review! @Neolit No worries! But yes Push Square's review was excellent as usual they never get misty-eyed with unwarranted praise but never go looking for cheap headlines and 'hot takes'. @get2sammyb Is it true that the 4K mode brings the frame rate down to a distracting degree? This game is just amazing. and don't mind to those fake reviews,they are from people that only play xbox or pc so ofcourse they are going to downvote it to hell. that pcgamer review should say enough about that. This is the most excited I've ever been for a God of War game. I've played the previous ones and they were fine, but ever since this was announced and looked more thoughtful and less childish, I've been into it. Glad it turned out well, and glad this is the only game I've pre-ordered in 2018 so far. This is one of those games where the release feels like an event along the lines of a holiday instead of just another release date. @get2sammyb nice review i was wondering if you could explain a little bit about the photomode feature??? Seems like God of War has done its job perfectly. I haven't played ANY of the previous GoW games, but I'm definitely pre-ordering this now!! What with Far Cry 5 & Ni No Kuni II there just ain't enough hours in the day to play all these great games On a side note, anyone know why you still can't pre-order this on Amazon (UK)? They list it as "currently unavailable" yet it's out in 8 days! Strange. Excellent review @get2sammyb..I was looking forward to this game before but I'm now as hyped for this as I was for Horizon Zero Dawn which was my game of the year! A perfect 10 is not something I was expecting though.Is there no negatives at all? I cried, can’t wait for my copy to arrive, word up Sammy! It’s 94 on Metacritic with 75 reviews, that’s a huge GOTY contender. Without the spaces in the code. Give it a try and if you get it wrong I'll just edit your post so it works! As a reviewer I get most of my games for free and this has caused me to become a complete snob. I now find that having to actually pay for games is sickening. But I'm prepared to make an exception for God of War. Day one! @Neolit I'm certain that's the case, but the second to last paragraph told me all I needed know! Hey @get2sammyb great review. One question, does the game have loads of extras like the previous entries after you finish it? As in, behind the scenes videos, artwork and assets galleries etc. Would be good to know! @playstation1995 we've been awaiting your arrival, Sir (Madam?) Word up, son. @playstation1995 Your loyalty to Kratos has been rewarded. @playstation1995 The king is back, word uuuuup son! @get2sammyb Great review, and glad to know that it's a 'worth the $60 price tag'. My question, if there is online play function on it, how bad is it to get a platinum trophy without having to play online. @get2sammyb hi Sammy, does the game support 3D audio? Do we know if Sony are planning a custom setting for the platinum headset? @Clutch_Nixon @get2sammyb Yeah, I'd really like to know that as well, the Platinum headset needs more 3D audio support. @playstation1995 do you think Spider-Man is also a GOTY contender? @dark_knightmare2 Because he may want different things from a video game? You know...because everyone is different. Looks good. I'll slap it on my to buy eventually list. I have no money in April. @ShogunRok I get the impression you were an elitist snob before being a reviewer and getting stuff for free. I maintain review copies should be returned upon completion. After all you dont get to keep a car for review. I'm so glad this is living up to the hype. This is why I have a PS4. Sony just release pure class! @playstation1995 hope you enjoy this as much as you've been looking forward to it bud! @get2sammyb Nice review, though both Sony and Santa Monica are probably mad at you for starring off with GoW Ascension as I'm pretty sure we are supposed to forget that game exists. Oh, and the formula being stale didn't do that game in, focusing on multiplayer did. This looks awesome!!! Great review sammy!! @kyleforrester87 Hey its true. Some people look for different things in games. As for the review copies comment thats just how I personally feel. @YummyHappyPills perk of the job mate. Maybe if you were employed (you'd have to be employable first, eh?) you'd also enjoy a few of life's treats. @kyleforrester87 I get games for free too. Usually on Steam of course thoughba few have been offered to me on PS4. But I dont enjoy it. I'd rather a transaction takes place. And thanks. I'm not employed because I cant walk. I've had two corrective surgeries to stop an infection entering my blood stream and killing me but even during recovery I am out looking for work. So right now I am enjoying the fact I am even ALIVE. But no, all that matters to you is putting people down. @YummyHappyPills keep on enjoying being alive mate, be nicer and smile more, we all got problems word up son! @kyleforrester87 Bit rich coming from the man who just cracked wise at someone without knowing their situation. Learn from your own advice first eh? We're 97 posts in and we're now derailing the comments section? Let's leave it there please. @kyleforrester87 I'm in a lot of pain, like the enemies of Kratos as he flings an axe through their heads. I suppose I'm more curious on just deep and expansive the combat options are in this. For 25 hours with a character that cant do more than puzzle solve and kill stuff in this game, it better be varied. And yes, it's a lot longer than I thought it'd be. @get2sammyb I've only skimmed through the review, since I want to know as little as possible before playing it (it helps that the developers didn't show much of the game so far, I feel like they only showcased one level) but I'd like you to ask you about the story. I know you said that it got you hooked from start to finish, but how does it compare to other great story driven games? It is of particular interest to me, because outside of the setting it's what will probably make or break this game for me. Excellent review. If I could just ask one thing: prior to GoW Ascension the formula had only been recycled 4 times surely? GoW came out, the formula was then recycled first for 2; and then for 3 and the two PSP games. Or am I missing something? @PS4fan Thanks for reading, nice avatar! @Greenmekon Weirdly, the modern Tomb Raider games. It's got the same structure as those, and Cory directed the cutscenes in the first one so there are similarities in style. God of War is MUCH better written and acted, though. @SKC_Diamond That review made me laugh. I'm pretty sure they didn't play the game. @Gamer83 I think you'll love the combat, it's no Devil May Cry, but it's really fun. @oatmealwarrior92 Thanks so much for reading. @Rob_230 If you're going to break it, this is the game to do it with IMO. Superb game. @Rudy_Manchego I was hyped for the game, but it exceeded my expectations. @Derpie1 I've beaten it. It is great. Outstanding, even. @redd214 I knew as soon as I played the first hour this was going to review very well. @Octane Nice! The last few paragraphs should be enough to convince you to pick this up! @leucocyte It's a very impressive Metacritic total, and so well deserved. @RoyalD There are ties to previous God of War games, but I wouldn't want to say much more. The story generally just begins at a random time, but that's what makes it so brilliant — it doesn't beat you over the head with what's been going on, and instead lets your brain fill in the blanks. I seriously cannot wait to ignore all of my family and friends and get sucked in to this game! 8 days left! @JohnnyShoulder You won't regret it! @hulkie How do you mean? Like, you mean can you go back and watch previous cut-scenes again? You can't, but it's worth noting that it's all done in real-time. There are no cut-scene videos in the game; everything is done in-engine and rendered locally on your PS4. (This means the file size is actually only 30GB). @Futureshark It's shaping up to be a cracker now. Monster Hunter aside I wasn't feeling 2018, but now with God of War and stuff like Spider-Man and RDR2 on the way, it's looking superb. @munkondi I think you'll be proven wrong; give it a shot and keep an open mind. @Retro88 @playstation1995 Word up, son! @wiiware Hope you love it as much as I did. @Bluetrain7 Yeah it's a shame everyone has to wait another week to play it, but it will be worth it! @Fight_Teza_Fight I'm going to try and find out what's going on with Amazon UK, it's very odd. @Jake3103 Not really. You could play this standalone and you'd be fine, but there are references that will help you to connect with Kratos a bit more. I'd recommend watching a recap video of the story so far. There are a few on YouTube. @antdickens It will thank you when you start playing! @Kidfried Thanks, it was a really hard video to do as well because Sony was very restrictive about what we could show/talk about. I wanted to leave just enough in to tease certain sections, without giving anything away. I'm happy with how it turned out! @get2sammyb I have one question, but I'm not sure if you're allowed to talk about this. They mentioned optional areas and bosses, are they easy to miss? I presume you can go back to them at any time, or is it possible to miss certain areas/characters/bosses and get locked out of them? Hadn’t been planning on buying this right away, but now I’m having second thoughts. It sounds like a game good enough to divert away from whatever collection of backlog games one might be playing and start up straight away. I don’t know. First world problems. I spent a lot of time exploring and engaging in (some of the) side-content during the story, which boosts the figure a bit. That's all optional, though, so if you want to run the critical path you can get through it a bit quicker. @PS4fan They're entitled to their opinion but upon scanning that I don't agree at all. @PS4fan There are a couple of patches yes, but they're only small ones. Just minor bug fixes and stuff. @Bad-MuthaAdebisi I was considering it, but nah, it's not that good! @Giygas_95 Just make sure you avoid spoilers. @BAMozzy I agree. I enjoyed God of War a lot, but after God of War 3 I was done with it. This completely injects new life into the series. There's much more depth and character to it now. @Neolit Sony's actually been very vigilant about spoilers for this. Reviewers aren't allowed to talk about some pretty big things in the game. @RegularGameFan Did you enjoy 3? @LaNooch1978 Not true IMO. I noticed a few minor dips in performance, but nothing major. The performance option is available on Pro if you want to lock it down, though. @jdv95 People are entitled to their opinion. I have read a couple of reviews where I've raised an eyebrow, however. @RoyalD what do you mean explanation for the end of the third? Great review, Sammy. The 20th can't come soon enough. @Shepherd_Tallon I think that's definitely what Sony's hoping for. @Retro88 There is no photo mode in the version that I've been playing, but apparently a patch is coming to add it in. I hope they can make it for launch because it's free advertising. @Nightcrawler71 No idea what's going on with Amazon UK. Looking into it. @Wazeddie22 10 isn't perfect, just the peak of its genre. I have a few minor gripes, but nothing really worth mentioning. @PS_Nation Definitely a Game of the Year contender. @DrClayman Unfortunately not, just the game and that's it. There's absolutely loads of post-game content to do, though, so it balances it out. @NintendoFan4Lyf Definitely pick it up when you can! @Tatoun It exceeded my expectations as well. @JLPick No online play at all. Strictly single player only. @Clutch_Nixon I don't actually know about 3D audio. There's definitely stereo positioning for the sound sources when you pan the camera, so maybeee? @GraveLordXD It's just over 30GB. All the cut-scenes are real-time, so the file size is actually smaller than you might anticipate. @Turismo4GT Almost answered them now. Phew! @rjejr Thanks for the correction, that's annoying! I'll fix that now. I have nothing further to add here, but loved reading the comment section. @R1spam Thanks! I love your username by the way. @Lurker It's up there for me. I thought it was brilliant. I mean, it probably wouldn't cut it as a movie, but as far as video game stories go... Definitely one of the better ones. @verynaughtyboy Well I was including the original as well. I see what you're saying — teensy bit pedantic, though. You knew what I meant. @Octane You can go back and do everything after you've "finished" the campaign. As far as I can tell, nothing is missable. @Agramonte It's a good week for PS4, as Yakuza 6 is also incredible. Can't really go wrong with either. Just a shame they both have to come out the same week. You should get a full-time job answering questions! @get2sammyb yeah the review is superbly written! It peaked my interest without mentioning anything spoilery! How do you compare the scale of this one? It's obvious it does not have a Cronos gight but it still seems pretty epic with the World Serpent, that weird dragon and such! @Octane It is my job today. I haven't gone on YouTube yet! @AFCC The scale is great. I actually think the camera being so close to Kratos helps with that in a way. You'll see what I mean when you play. I haven’t played God of War in so long. Only played the first game back on PS2. Still playing Persona 5 and the next game I’m getting is Yakuza 6, but I’ll keep this game in mind. Something different for me. @get2sammyb I actually understand what you mean! Limiting your view makes you feel tiny like Kratos I guess! @get2sammyb Thanks, that does sound pretty good! I'm not worried about it anymore, I saw enough videos that I know I'm going to like this game. The only thing will be balancing this with Yakuza 6 which I also plan to get day one. I know Yakuza games take me a long time to play and it seems GoW is also a pretty long game. I don't know about the rest but I am missing @themcnoisy in the comments for this jewel. C'mon mate. The battle in the main review image wouldn't have started over who had the better beard would it? Nice to see that it's reviewing well! @YummyHappyPills a transaction does not need to involve money. A game in exchange for a review qualifies as a transaction. @get2sammyb Will do. Could be difficult though. For any one that follows WWE and NXT, I can't look at Tomasso Ciampa without thinking of PS4 Kratos! Thanks @get2sammyb for your response. 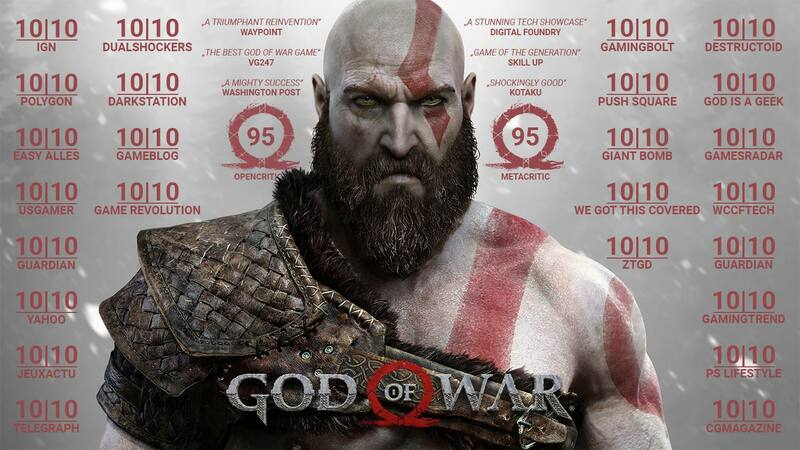 @playstation1995 I cried with all these great scores, Kratos is our champion, the king of kings. Word up my son. Thanks @Neolit Im just at work. Cutting up Norse bad guys and my sons on work experience helping me out. Will let you know when Ive finished smashing this Dragon so I can catch up with the comments. @get2sammyb I was on the fence with this one... but just fell off. Nice review, and thanks! @hi_drnick He reminds me more of WM34 HHH. Paul Levesque to play Kratos in a movie. Looking at my twitter feed it's like one big celebration. April 20th can't arrive soon enough so we can all finally experience this masterpiece. @porhawj2016 In performance mode you get 1080p image rather than checkerboard 2160p. The game downsamples so I personally thought the resolution mode looked better, but they both look amazing. @Gamer83 Well said, I can't wait anymore for this masterpiece, already pre-ordered my copy. @porhawj2016 Given the marketing push - I should thing that there have been plenty of discs produced! Downloaded God of war 3 Remastered and finished it just to lead up to this one. Need to do some serious late nights to finish other games before it's out! @get2sammyb Great review. I just have a few questions. 1) I never played a God of War game do.I have to enjoy this game or understand the story? 2) Would you say this game.does to the God of War series what Assassin's Creed Origins did for the Assassin's Creed series? 1) No you don't have to have played them, it works as a standalone. However, there are wrinkles to Kratos' character that won't resonate without the context. I'd recommend watching a recap on YouTube, there are a handful of good ones. 2) Definitely. Although I'd argue it goes further than that. This is a much bigger change. @get2sammyb thank but i see favor resolution will enable supersampling mode that added in PS4 5.50 firmware update. Can you tell us how many trophies does this game have ? 51 trophies ? i love collect trophies on games what i played. i has about 10,445 trophies now because i need collect gold, silver and platinum trophies for earn Sony reward points by those trophies. @porhawj2016 We can't talk about the Trophies I'm afraid. There are fewer than 51. I don't have a disc copy so no idea what art they used. @get2sammyb Ok good to know, looks like I will check it out here in a few months after I finish a few other games. I'm going to ask for this as my Father's Day present. I think that would be appropriate. My wife may have to buy it on my kids' behalf. Either way, I'm having it. @get2sammyb You can probably guess my question Sammy, but how was the music? The snippets I've heard here and there in the promotional material sounded incredible, but curious to hear how it sounded in-game. This is the only review I've read today, seen the scores on Gamerankings but I trusted Sammy and PS not to give out any spoilers. I wasn't disappointed. @gbanas92 Absolutely superb. I thought about you a lot, particularly at the start where the music stands out particularly strongly. @adf86 Awesome, thanks. To be fair, it looks like everyone's been on good behaviour. Haven't seen any spoilers anywhere fortunately! Good to hear that the game "starts off like a rocket"...I was getting reeeeal sick of the boring intro scenes in single-player games, to the point where I'll just abandon the game altogether (Uncharted 4 comes to mind). Nice, been a long time since I got a PS4 game day one. Surprised nothing mentioned about FPS vs better picture? @playstation1995 Personally I think Spider-Man will be a good and fun game but I don't think it will be a Game of the Year contender. I have that, as well as GoW pre-ordered - both steelbook editions but I can't see SM beating other games that are expected this year. When you consider that there is also Red Dead Redemption out, a game that others are scared to go up against - inc the mighty juggernaut of CoD as well as games like Detroit, Dreams, Tomb Raider, Metro Exodus, BioMutant etc as well as games like Far Cry 5 and Monster Hunter that have released already. wow, great review!! guys roll on release day!!! @get2sammyb yessssss. I'm even more excited now! @smelly_jr Haha, the first hour is brilliant. It's got a bit of everything and really sets up the rest of the game. @bbq_boy Awesome, you'll love it. @eltomo I did a video on YouTube which you can check out. I'll post it on the site later in the week. @playstation1995 I get what @BAMozzy is saying about Spider-Man, though. It's definitely looking like the best Spidey game in a long, long time and will almost certainly be top-drawer, but I'd be surprised if it resonates on an emotional level like God of War does. It's just a cut above really. @get2sammyb Sammy, one last question, please! What difficulty did you use? I'm kinda on the fence between hard and normal! Since the game has no camera cuts I kinda don't want to die so the camera doesn't really cut xD but also I want some kind of challenge! What do you feel is the best? @get2sammyb Is the command to direct Atreus mapped to a single button (triangle, square, etc) or is he summoned by a context sensitive on-screen prompt? @AFCC I played on Normal. I didn't die much, but felt like I was just scraping through encounters. Felt just right to me. @Bluetrain7 Yep, Atreus is mapped to Square. @get2sammyb Sammy, can we expect a dance mode after the launch? Because I always dance when I listen the orchestrated theme of E3. @get2sammyb normal it is! Thanks again! @get2sammyb I fell. No seriously that was a fantastic write up (shouldn't of even doubted you ) not an inch of spoilers in sight and reading the part about optional bosses and abundant puzzles got me going. This is going to be insane. I think its a bit too early to be talking about GOTY yet though ! Especially when you consider how many unannounced games are yet to be revealed at E3 that'll be released towards the end of the year, then there's the announced games that don't have release dates yet that still might drop in 2018 like Metroid Prime 4, which will easily be a contender. This year is shaping up to be a great year for gaming ! Nice review! You blew the comments section up! Well done! @get2sammyb I preorder a AAA title every other year, on average. No joke, I went and preordered this game last night because of this review. I'm all in, and I can't wait. @get2sammyb Thank you for being so responsive in this comment section. Seeing as he is mappped to that button, will this website receive a temporary logo update for launch day? @get2sammyb I'm not sure if anyone else asked it before, but could you elaborate some more on the side content? You mentioned the handful of side quests but are they actually good and fleshed out or mainly serve a distraction? @THEundying27 Now now, let not have any of that. Who knows what MS will be revealling at E3 that will have PS owners be the ones doing the 'port begging'. Let's all just enjoy games, regardless of platform. @glassmusic Nice! Hope you love it. @Lurker They're... Pretty good. It's more of the same stuff you'll have done in the main campaign, but there's new story, dialogue, puzzles, gameplay challenges. They're not The Witcher 3 side-quests, but they're good. There's also absolutely TONS of general collectible stuff. @Everyone Can we knock off the console wars crap. This is a review about God of War, no one cares what Microsoft will announce at E3 or whether Metroid is coming out in 2018. You can discuss all of that on the forums. @playstation1995 Wow, laughing at one of the best and most highly rated franchises in the whole of gaming, God of War is good but its no Metroid lmao i realise you seem to only buy Sony consoles but you should branch out a bit, you're missing some seriously good franchises out there. @RidingMower Wow that's hugely impressive ! Thanks for sharing this in-depth review ! I look forward to playing this when I can get around to it. I still need to wait for BF 2018 sales, and also beat GoW 2-3, Ascension, and the two spinoffs. I'm seeing a lot of words, without really any information. I still have barely any idea of what you do in the game. @RainbowGazelle Are you sure you read the same review the rest of us did? What I got out of it was excellent combat, storytelling, world building, puzzles, side quests, post game content, optional bosses, and some RPG elements thrown in for good measure, all wrapped in a beautiful package. @RedMan33 Yeah, I noticed that too. Watching the trailers won't spoil anything, none of that is in the game the way you think it is. Digital copy is downloaded and the clock is counting down. Midnight can’t come soon enough. I just want to feel the rumble of the controller when the axe cones flying back to the hand of Kratos. I’m going to be distracted at work thinking about playing it and staring at my new Kratos Funko POP figure on my desk. I was disappointed that the digital art book, comic, and dynamic theme will not be unlocked until midnight either. @Bluetrain7 I can understand the art book and comic because they may have spoilers. But why is the theme locked? That’s really strange. Xbot tears taste soooo good mmmmmmm! Its ok i only play on playstation, im really not missing ANYTHING on xbox, i guess except games from generations ago. Have fun! @bbauer36 Don't do this, just enjoy the game. I am so ready to get it tomorrow! This is by far the best review of any game I have read from you I am not sure if im getting this until the end of may but I have to admit it looks utterly stunning did you do your review based on the pro or OG ps4 ? I haven't played any GOW games and have a huge backlog of other games. This has caught my eye though, purely cos the story looks interesting. Would I need to play the previous games before playing this? @AshM No it works on its own. There are some references, so watch a YouTube recap and you'll be fine. @get2sammyb thanks. Might pick it up over the weekend. Love a decent story and looking for something different.